Opportunities and risks of Cloud Computing for Small Business can be calculated and the calculation supports the decision for or against the cloud model. Previously we wrote about the strategic requirements for including cloud computing for small businesses, which is definitely a starting point for a small business owner. Now, let us understand this part – quite practical part – the end result. If we calculate the opportunities and risks of Cloud Computing for a particular company – the company should be able to understand, to what extent and in what way the given resources can be used profitably to implement the changes. Re-read the previous sentence if required. One example will clarify – suppose Rackspace’s one Cloud Hosting Service offers a third party Mail management service Free of cost, over and above what is available for Free of cost to general users (take that it is 75K bulk Email sending per month) versus HP Cloud at nearly the same cost – opportunity of marketing for this example is getting extended for free of cost. The above example is indirect increase of opportunities. This is actually not what we going to discuss in this article named Opportunities and Risks of Cloud Computing for Small Business. These are extra which you must calculate – we provided you a leading thought. Main advantage of the cloud model is the reduction of IT costs and the related improvement of competitiveness. The recurring or onetime costs for hardware, software, power and personnel in the company are thus considerably decreasing because of a local installation and maintenance of application software and hardware is at customer level, which is depending on the type of outsourcing. Particularly the personnel costs and practical issues with man management, which typically account for the largest cost factor within a company is minimized. The list of benefits is complemented by the ability to use this functionality from any location.The infrastructure of the sites can be very different, but it provides a common base on the cloud architecture on a higher quality standard but avoids high investment costs and the implementation of risk in the procurement of complex information systems, such setup otherwise might be enormously beneficial for the customers. Microsoft can buy or build a data center easily only for one department – for example ERP or Billing. But before Cloud, practically it was out of thought for the small business owners. Precisely, the small businesses can benefit from high-quality IT services without the need of large investment with contractually guaranteed quality of service. The scalable services on the cloud has the option of short-term adaption of an application’s performance depending on the agreed level of service based on the current demand or need. This usually accounts for freeing up the funds to other areas to accrue. From the reduction of implementation time for software and software updates, company can look at the interaction speed to win the market and shorten the time to market – significantly significant. A positive side effect is incurred to the customers, because the need for contracts for hardware, software and network to negotiate individually, will usually be unnecessary. The need for standardization of the processes and interfaces in small businesses creates better conditions for integration into the value chain of customers and suppliers, thereby creating more competitive potential. Cloud computing can therefore optimize production processes, thereby helping to shape the cooperation between enterprises effectively, especially when the requests are handled by the same provider. The cloud customer has to only look at the interfaces within the company. Overall, the cloud model thereby leading to a higher flexibility than the classical in house model. Notwithstanding these advantages, the use of cloud services first requires initial investments. The downside of this is especially evident in the compromises that result from the standardization processes. Because the cloud business model works mainly for the service only if the customer is willing to run their applications on a server used by multiple customers. Own solutions or the transfer of specialized hardware and software, as these tend to be in use in many SMEs, here cloud services might provide little benefit. The customer has little opportunity to implement its own business processes, depending on the depth of the cloud integration, adjusting the requirements. It follows that one of the key factors for the success of cloud applications, the appropriate selection of applications and resources for outsourcing. Therefore, only the applications best suited for cloud coming in the processes are with low complexity and where only a small adjustment is needed, such as word processing or accounting applications. Basically, all of these applications and multi-user capability for usage on the Internet are currently not suitable for many small business. We need to calculate the cost of bandwidth, cost of electricity for running the users’ computer. Problems in the integration of existing software and hardware is another significant disadvantage of the cloud model. Companies usually take into account when deciding on a software not only the functions contained therein, but also the required applications and system solutions that is existing. Currently, however, there are only a few cloud service providers which are compatible with each other. Those who opt for a provider, usually has to stay with this one, because additional interfaces or individual adjustments are too expensive in cloud. A quick change to another provider is therefore difficult to implement. Another key aspect of cloud as with ASP and SaaS is the concept of task-specific SLAs. The cloud model consists of many interfaces, such as network, operation, maintenance, integration. Therefore, other third parties will have to be involved, which in turn can lead to an increase in administrative expenses in the contract. This Article Has Been Shared 1549 Times! 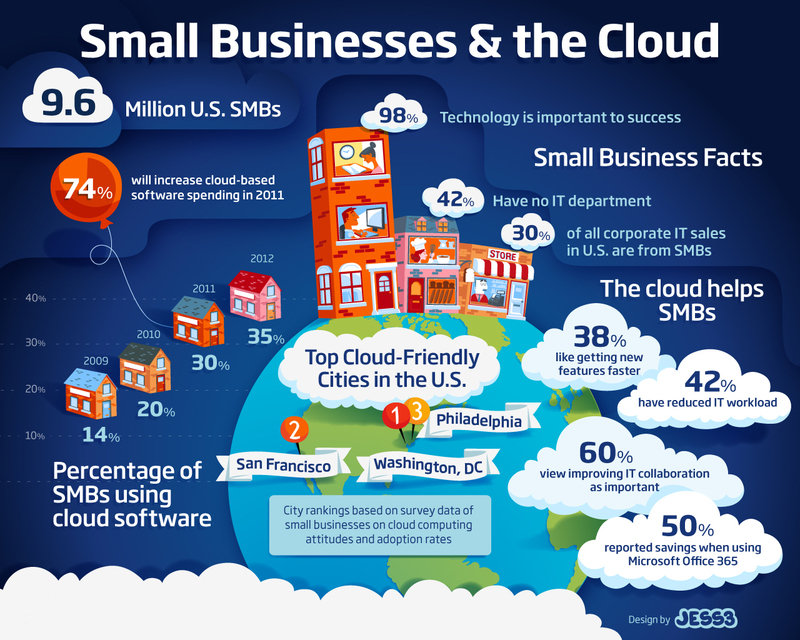 Cite this article as: Abhishek Ghosh, "Opportunities and Risks of Cloud Computing for Small Business," in The Customize Windows, October 29, 2013, April 23, 2019, https://thecustomizewindows.com/2013/10/opportunities-and-risks-of-cloud-computing-for-small-business/.